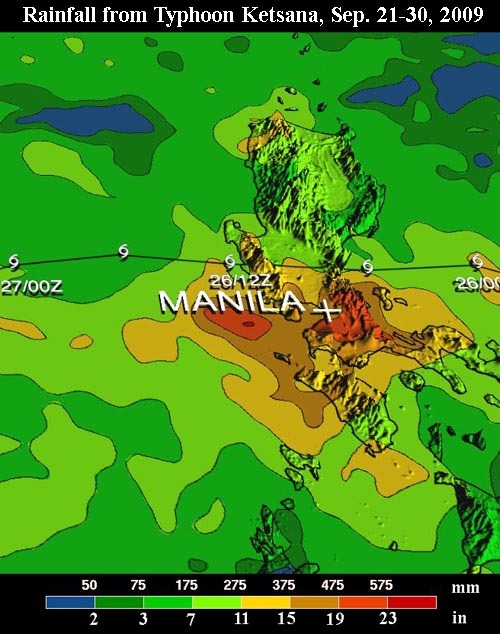 Intense Rainfall - Manila Typhoon Center - Your online resource for typhoon updates. Today we will deal with Intense Rainfall, the most looked at part in a storm. 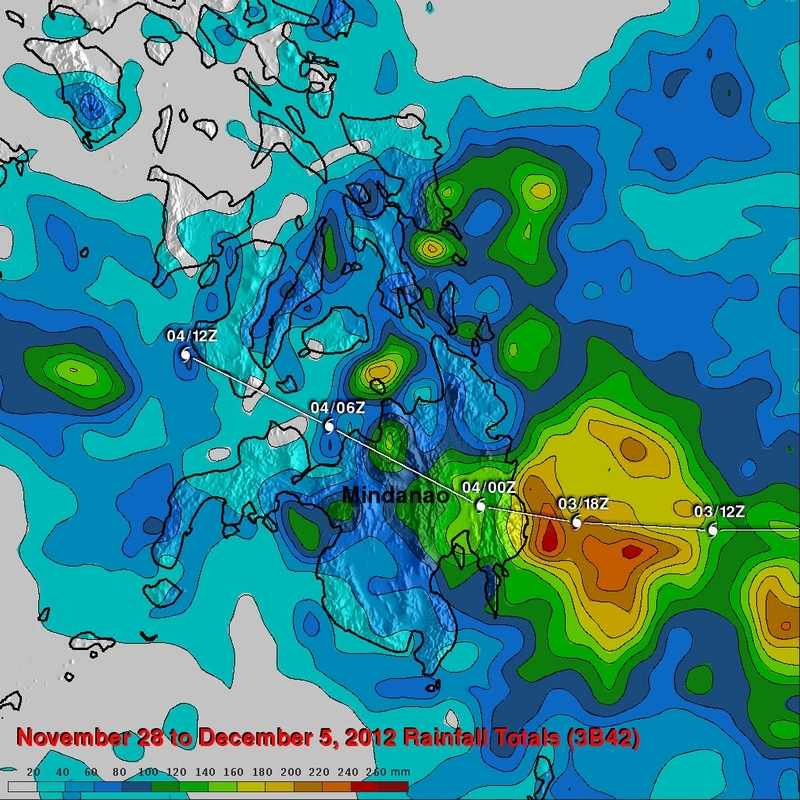 Total estimated rainfall from 2009 Typhoon Ketsana/Ondoy, as estimated by NASA's TRMM satellite. Image credit: NASA/TRMM project. Total estimated rainfall from 2011 Tropical Storm Washi/Sendong, as estimated by NASA's TRMM satellite. Image credit: NASA/TRMM project. Total estimated rainfall from 2013 Super Typhoon Bopha/Pablo, as estimated by NASA's TRMM satellite. Image credit: NASA/TRMM project. The thunderstorm activity in a tropical cyclone produces intense rainfall, potentially resulting in flooding, mudslides, and landslides. Inland areas are particularly vulnerable to freshwater flooding, due to residents not preparing adequately. Heavy inland rainfall eventually flows into coastal estuaries, damaging marine life in coastal estuaries. The wet environment in the aftermath of a tropical cyclone, combined with the destruction of sanitation facilities and a warm tropical climate, can induce epidemics of disease which claim lives long after the storm passes. Infections of cuts and bruises can be greatly amplified by wading in sewage-polluted water. Large areas of standing water caused by flooding also contribute to mosquito-borne illnesses. Furthermore, crowded evacuees in shelters increase the risk of disease propagation. The rain bands and thunderstorms associated with a tropical cyclone, regardless of its wind intensity, are often heavy and accumulating. Such heavy rains can even occur well inland from weakening tropical systems. It is not uncommon for a tropical system to dump 10-15 inches of rain as it moves over a given area. Slow moving systems, have dumped 20 to 30 inches of rain, respectively. Other tropical cyclones only dump a few inches of rain, especially if moving fast. Rain from tropical cyclones, especially hurricanes (referred to as "violent rain"), is nearly impossible to measure, because it falls "sideways" with the winds and "misses" the rain guages. It has been observed that strong winds blow water into a building wall "coating" it with several inches of water. Between gusts, when the wind let up briefly, all that water came cascading down at once in a waterfall! Do not belittle a Tropical Depression or a Tropical Storm. The statement above applies as ANY intensity of a Tropical Cyclone can do damage through intense rainfall as the TC passes over the region. The intensity of a tropical cyclone appears to have little bearing on its potential for rainfall over land, but satellite measurements over the last several years show that more intense tropical cyclones produce noticeably more rainfall over water. Flooding from tropical cyclones remains a significant cause of fatalities, particularly in low-lying areas. While inland flooding is common to tropical cyclones, there are factors which lead to excessive rainfall from tropical cyclones. Slow motion, as was seen during Super Typhoon Pedring (Nesat) in 2009, can lead to high amounts of rainfall. The presence of mountains/hills near the coast, like across much of the islands of Eastern coast of Luzon (Sierra Madre mountains), Samar, Leyte and Eastern Mindanao, signify rainfall potential due to forced up-slope flow into the mountains. 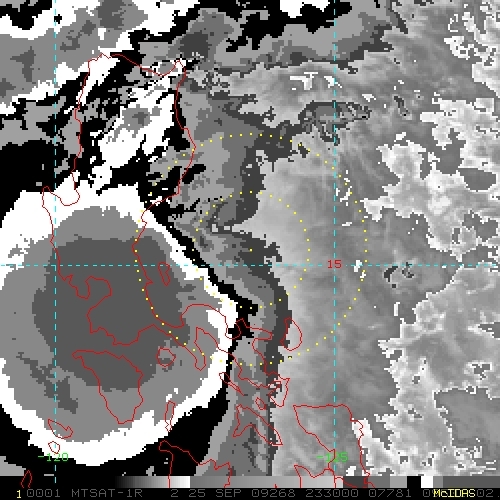 This effect was more pronounced during Tropical Storm Ondoy (Ketsana) in 2009 and Super Typhoon Pablo (Bopha) in 2012. Larger tropical cyclones drop more rainfall as they precipitate upon one spot for a longer time frame than average or small tropical cyclones. A combination of two of these factors could be especially crippling. As part of the East Asian Monsoon, the Habagat, as locally called, is a moisture laden windflow from the South China Sea sweeping from the Southwest bringing rain towards the western parts of the Philippines. This weather system is responsible in heralding the Rainy Season from May to late September. In the Philippines, during times where even a Tropical Cyclone even veers towards the Ryukyu Islands in Japan, intense rainfall can be produced by an enhanced Southwest Monsoonal windflow, causing flooding across the entire Western seaboard of the Philippines. More so over Western Visayas, Palawan, Mindoro, and Western Luzon including Metro Manila. 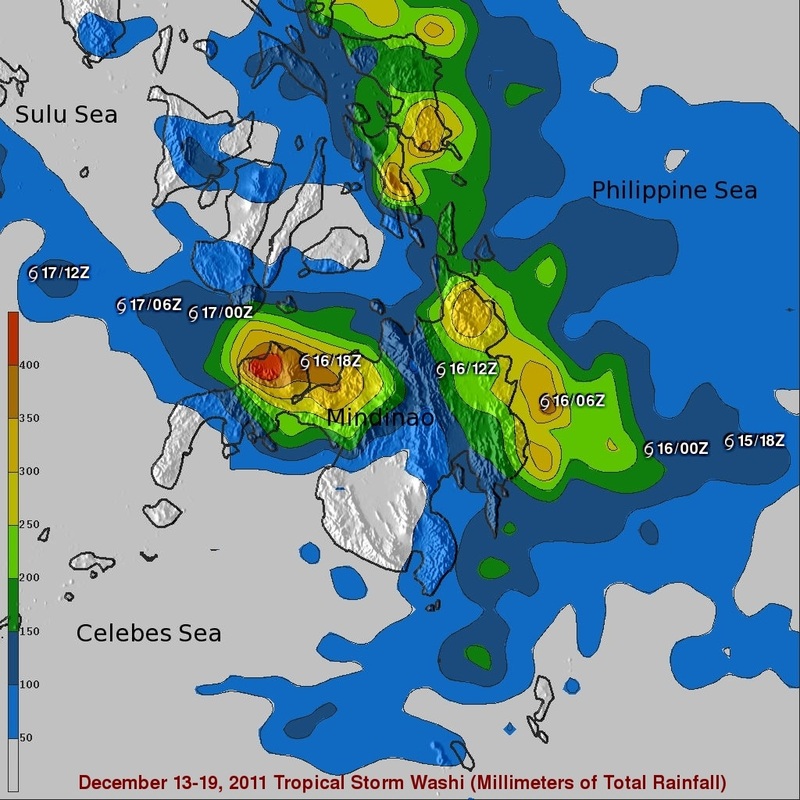 A recent case was during the 2012 Habagat flooding in which there was NO TC within the Philippines AOR but the Southwest Monsoon was intensified by Typhoon Haikui. Here is a video of our friend, James Reynolds from Earth Uncut Productions during the massive August 8 flooding in Metro Manila. 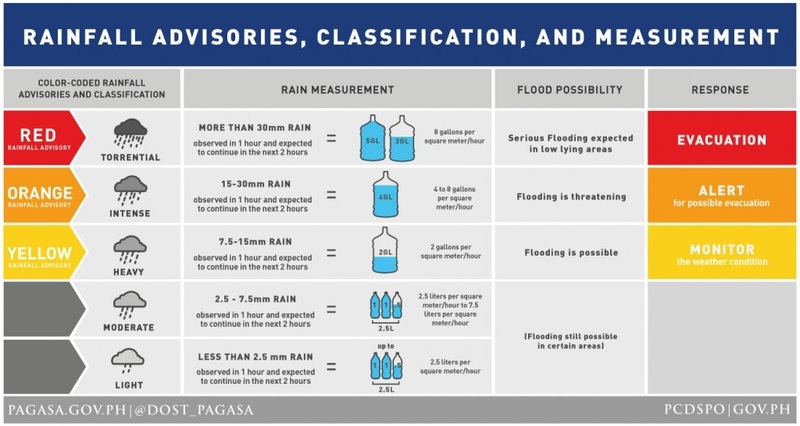 During the 2012 Typhoon Season, PAGASA devised a warning system to advise residents of Metro Manila of impending heavy and flooding rainfall. This system is to be implemented throughout the country by 2013. This is in response to the massive flood events over the recent years. To give you a sense of how much rain is what, here is a video depicting such amount. Courtesy of DOST-ASTI, Project NOAH and Climate-X. MTC will post the following images below on our facebook page once PAGASA provides the warning.